Our new MP-265/M “narrow format” mechanical is designed especially for patch-slice manipulator systems that require more than 2 or 3 pipettes. Coupled with our multi-manipulator controller, MPC-200, users have the ability to easily build up multi-manipulator MPC-365 systems for positioning multiple recording and stimulating pipettes. The MP265/M mechanical builds on our existing manipulator line in several ways. First, narrow format means more manipulators can be grouped around a recording chamber. 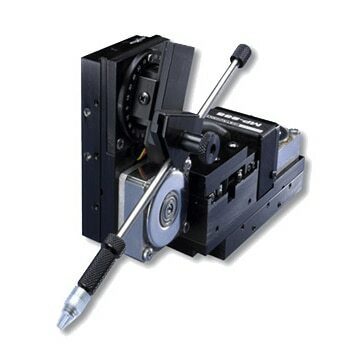 A long throw (25 mm) radial X-axis provides an easier approach to and from the optical center. Finally, travel in the Y-axis is shortened (12.5 mm) to economize on width, which is made possible because radially oriented manipulators do not require long travel in this axis. The MP-265/M manipulator is designed specifically for systems requiring 4 or more manipulators. To this end, we have put together systems with special pricing for 4, 5 and 6 manipulators, and 2 or 3 dual manipulator controllers. We are also unveiling a new linear slide for mounting the MP-265/M mechanical as well as for our other manipulators. With the linear slide gantry (MT-75/LS), the manipulator can be quickly and smoothly moved out to a location where there is easy access to the pipette for replacement. A single controller capable of running 2 manipulators! Sutter Instrument has taken the simplicity of the MP-225 controller and expanded it to run two manipulators from a single controller/ROE. The MPC-200 works with one or two of our world-renowned mechanicals, the MP-285 (MPC-385) or the MP-225 (MPC-325). The controller is self-detecting so there is no need for manual configuration of the components. If two manipulators aren’t enough, a second controller can be daisy chained to allow the single ROE-200 to move up to four manipulators. Thus the system can be easily expanded to control highly sophisticated experiments. The Sutter MPC-200 is electrically quiet. Unlike the competition, our multi-unit controller employs linear output circuitry. Sutter adds additional manipulators to the same controller without requiring potentially noisy chopper drives. Faster automated pipette exchange. The MPC-200 has faster “Home” and “Work Position” moves for quicker pipette exchange. Automation is set up and run via the same interface used in the MP-225 controller; however, the speeds of the automated movement are much faster. Accelerated manual mode. For users who prefer manual pipette exchange we have added “Accelerated Mode” to the ROE. Using Accelerated Mode, the user can make quick manual moves in and out of a setup. Accelerated Mode amplifies the speed attainable in a manual move by smoothly accelerating to the maximum speed during sustained, fast turns of the ROE. Accelerated movement ends as soon as the user stops turning the knob. This mode can be fully disabled for those who feel the need for direct control of the pipette. To provide the ultimate in flexibility, the MPC-200 can be purchased separately or in one of several basic systems such as the MP-365, MP-385 or the MP-325. Additional component pieces can be added at any time, allowing the user to develop a system tailored to his or her particular needs. Minimal microstep size is 62.5 nanometers per microstep. Display has single micron resolution.